Don't Know Why by Norah Jones. Arranged by Paul Murtha. For Tenor Saxophone, Trumpet, Vocal, Jazz Ensemble, Flugelhorn (Score & Parts). 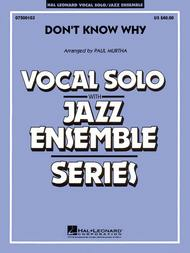 Hal Leonard Vocal Solo/Jazz Ensemble Series. Pop Vocal and Jazz. Grade 3. Score and parts. Published by Hal Leonard (HL.7500103).Recorded by newcomer vocalist Norah Jones, this haunting tune is a current hit on the pop charts. With a beautiful melody and smooth harmonies, this is a wonderful contemporary feature for vocalist. This arrangement may also be used as a feature for flugelhorn or tenor sax, in place of the vocal part. Don't Know Why by Norah Jones. By Jesse Harris. Arranged by Michael Sweeney. For Jazz Ensemble. Discovery Jazz. Grade 1.5. 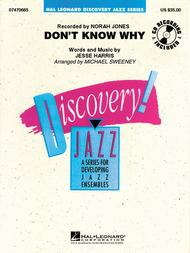 Published by Hal Leonard (HL.7470665).Discovery Jazz – Grade 1.5Here is a nicely scored arrangement of Norah Jones' award-winning hit designed for beginning players. The opening verse can be played either by a sax solo or as a section feature. Later, the brass get a taste of the melody and there is a short written (opt. ad lib.) solo for trumpet. Very smooth! Don't Know Why by Norah Jones. For piano and voice. Pop; Rock. PV. 6 pages. 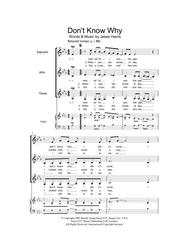 Published by Hal Leonard - Digital Sheet Music (HX.240888).About Digital Print Sheet MusicDigital Print is printable sheet music available anytime, anywhere. Just purchase, print and play! View your online sheet music at home, school, work or anywhere you have a computer connected to the Internet. Use our iPad app to view your digital sheet music on the go. With Digital Print, you can print your digital sheet music immediately after purchase, or wait until its convenient. And our software installation is easy - we'll guide you through the simple steps to make sure you have Adobe Flash Player, Adobe AIR and the Sheet Music Plus AIR application. Don't Know Why by Norah Jones. By Jesse Harris. For SSA choir (SSA). Jazz; Pop; Soul. Choral. 5 pages. 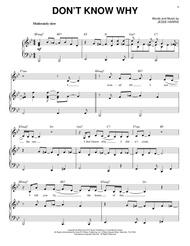 Published by Hal Leonard - Digital Sheet Music (HX.127819).About Digital Print Sheet MusicDigital Print is printable sheet music available anytime, anywhere. Just purchase, print and play! View your online sheet music at home, school, work or anywhere you have a computer connected to the Internet. Use our iPad app to view your digital sheet music on the go. With Digital Print, you can print your digital sheet music immediately after purchase, or wait until its convenient. And our software installation is easy - we'll guide you through the simple steps to make sure you have Adobe Flash Player, Adobe AIR and the Sheet Music Plus AIR application.